Oscar nominated independent animator Bill Plympton ("Your Face", "Simpsons", "Idiots and Angels", "Cheatin") teams with underground animated filmmaker Jim Lujan ("Sanjourno Must Die", "Freakdaddy", “Spike and Mike”) for the upcoming feature-length animated film "Revengeance". 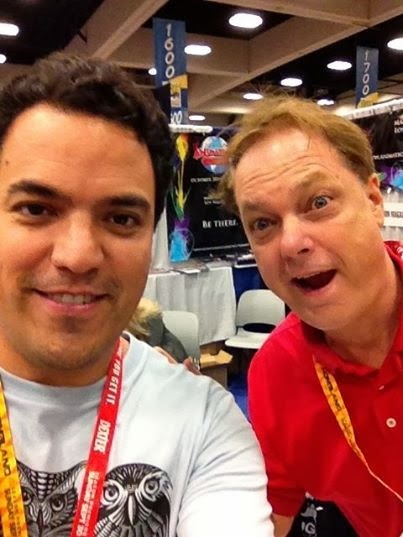 Plympton will draw, animate, and produce the film, while Lujan will write, design, and voice many of the characters himself. "Revengeance" is described as a "Tarantino-esque biker revenge dark comedy", and has entered pre-production based on the screenplay by Lujan. Revengeance POSTED BY: Bill Plympton I first met Jim Lujan through my good buddy Ken Mora in 2009. If my memory is still intact, I recall he came to interview me on one of my visits to L.A. - perhaps I was there for the ASIFA Hollywood awards show, The Annies. Naturally, I never got around to it. Yet, I kept running into him at various animation functions: San Diego, The Annies, Burbank Film Festival, etc. He then gave me a DVD of his cartoon shorts and one day while I was bored, I slipped it into my DVD player and discovered a truly original writer, humorist, and designer.